When Monsignor Frank Leighton, the beloved spiritual leader of St. Bernadette's Church claims to have had a visitation from Saint Jude (the Patron Saint of Lost Causes), it sends the parish and all those around him spinning out of control. Is the Monsignor delusional? Is he suffering some sort of breakdown? Or has he truly witnessed a miracle? Standing in his way is Father Todd McKay, a young priest and one-time apprentice to the Monsignor. Faith and perception are stripped away as the two men struggle to confront the truth of Monsignor Leighton's revelations, and in the process open old and new wounds. "Thank God. A new play about Catholic priests that mentions neither pope nor pedophilia." 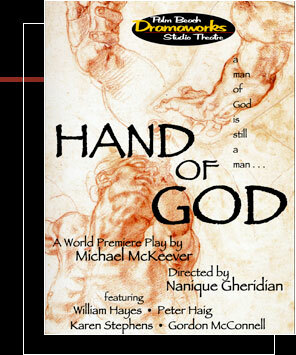 "Hand of God goes an extra step by trying to separate faith in oneself, and fellow men, from pure religious belief."